"Do YOU know dae wae?" 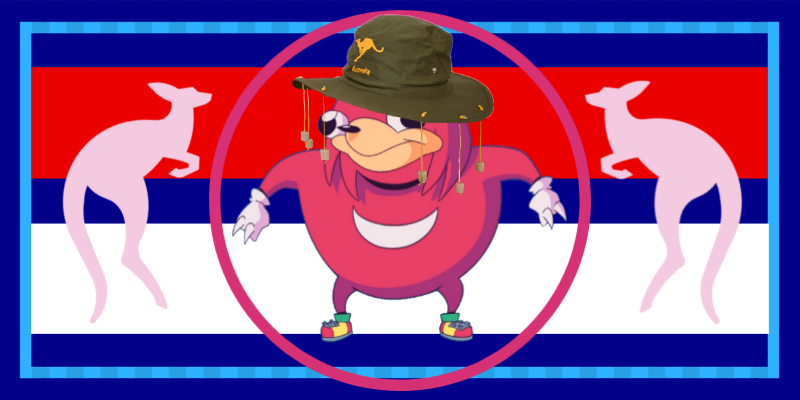 Da Great Wae of Ungandan Moose Knuckles is a nation led by General HelloTher on the continent of Australia. Da Great Wae of Ungandan Moose Knuckles's government is a Democracy with very moderate social policies. Economically, Da Great Wae of Ungandan Moose Knuckles favors left wing policies. The official currency of Da Great Wae of Ungandan Moose Knuckles is the Australian Dollar. At 104 days old, Da Great Wae of Ungandan Moose Knuckles is a mature nation. Da Great Wae of Ungandan Moose Knuckles has a population of 611,567 and a land area of 9,025.00 sq. miles. This gives it a national average population density of 67.76. Pollution in the nation is a disaster. The citizens' faith in the government is at an all-time high with an approval rating of 100%. A nation founded on the belief that all women are queens in the Eye of Da Waeward One. If one does not know da Wae, den one is lost. We are a humble and small area, however, we believe in open trade with any nation willing to do so. We do not wish to involve ourselves with conflict but understand we must if we have to. We hope you enjoy your stay at Da Wae!! 04/16 01:47 pm - founded a new city, New Bordeaux. 04/11 01:41 pm - Ungandan Moose Knuckles changed their Color Trade Bloc from Gray to Lime. 04/06 06:25 pm - Ungandan Moose Knuckles had war declared by COWS & HIPPOS for the reason of "We like taking candy from babies". 04/05 06:06 pm - Ungandan Moose Knuckles declared war on Whaleland for the reason of "You are battling my allies. I must step in.". 03/29 05:24 pm - Ungandan Moose Knuckles declared war on Grig Hold for the reason of "Bounty Claim". 03/29 05:16 pm - Ungandan Moose Knuckles declared war on Qwefty for the reason of "Bounty Claim". 03/26 03:07 pm - Ungandan Moose Knuckles declared war on Como for the reason of "Inactive". 03/26 03:06 pm - Ungandan Moose Knuckles declared war on Great Hungary for the reason of "Inactive". 03/26 03:05 pm - Ungandan Moose Knuckles declared war on UA HIGH for the reason of "Inactive". 03/26 03:03 pm - Ungandan Moose Knuckles declared war on relicted for the reason of "Inactive". 03/26 02:30 pm - Ungandan Moose Knuckles declared war on The Candorian Empire for the reason of "Inactive". 02/25 02:43 pm - Ungandan Moose Knuckles declared war on Confederacy of Independence for the reason of "Inactive". 02/25 02:42 pm - Ungandan Moose Knuckles declared war on Elementaria for the reason of "Inactive". 02/25 02:40 pm - Ungandan Moose Knuckles declared war on Northern Rhodesia for the reason of "Inactive". 02/25 02:39 pm - Ungandan Moose Knuckles declared war on Narshada for the reason of "Inactive". 02/25 02:38 pm - Ungandan Moose Knuckles declared war on Sefton for the reason of "Inactive". 02/21 04:14 pm - Ungandan Moose Knuckles changed their Color Trade Bloc from Green to Lime. 02/21 01:32 pm - Ungandan Moose Knuckles declared war on Mahdia for the reason of "Inactive". 02/21 01:28 pm - Ungandan Moose Knuckles declared war on Yunai for the reason of "Inactive". 02/21 01:28 pm - Ungandan Moose Knuckles declared war on Supreme provinces for the reason of "Inactive". 02/21 01:26 pm - Ungandan Moose Knuckles declared war on Riyadhia for the reason of "Inactive". 02/21 01:25 pm - Ungandan Moose Knuckles declared war on Zimbabwe for the reason of "Inactive". 02/21 06:34 am - The embargo on Ungandan Moose Knuckles placed by Sithar has ended. 02/18 12:59 pm - Ungandan Moose Knuckles declared war on Mashonaland for the reason of "Inactive". 02/18 12:57 pm - Ungandan Moose Knuckles declared war on Corellian Empire for the reason of "Inactive". 02/18 12:49 pm - Ungandan Moose Knuckles declared war on Vinh for the reason of "Inactive". 02/18 12:46 pm - Ungandan Moose Knuckles declared war on MoiraMainers for the reason of "Inactive". 02/18 12:45 pm - Ungandan Moose Knuckles declared war on Deminis for the reason of "Inactive". 02/15 05:55 pm - Ungandan Moose Knuckles declared war on Hmong republic for the reason of "Inactives get schmackted".